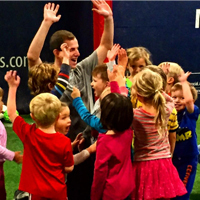 Seacoast United facilities can be booked for a sports-themed birthday party! We have soccer coaches available to run a soccer-themed party or organize your own party of any kind; football, wiffle ball, field hockey, lacrosse, yoga, etc. We have multiple party packages available at both our North Shore and Boston based club locations! North Shore area: Please contact James Costello at jcostello@seacoastunited.com with any questions.